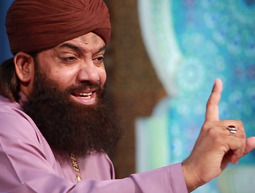 Imran passed his SSC in 1989 and passed his HSC In 1992, he completed a one-year course of “Qirat” from “Madrasatul Madina.” Despite of limited education, Imran Shaikh Qadri Attari managed to become a well-recognized Pakistani Naat Khawan most adored for his inspiring voice and lovely poem writings in expression of Prophet’s (صلى الله عليه وسلم) respect, admiration and love. He is best accepted as a marvelous Naat Khu’wan in Pakistan. Imran Shaikh Attari Naat are rich inaffection of Prophet Muhammad (صلى الله عليه وسلم) and ALLAH Almighty. He is a poet as well and mostly composes his Naats, himself. The most popular Naats of Muhammad Imran Sheikh are “Sarwar Kahun Kay Malik O Moula, Naad E Ali (S.A.W.W), Muhammad (صلى الله عليه وسلم) Na Hotay, Mhara Aaqa (صلى الله عليه وسلم) Aayo Jhoomo, Masha Allah Tabarak Allah, Asma Ul Husna.”. The latest collection of Imran Shaikh Qadri Attari Naats 2019 is available on HamariWeb. Muhammad Imran Sheikh started performing Naats at quite an early age and continued to be known for his good voice and well verses which he composed himself out of love of Prophet Muhammad (صلى الله عليه وسلم). Imran Sheikh became a renowned Naat Khu’wan in Pakistan and now performs on television, events and ceremonies. Imran Sheikh has become an inspiration for young Naat Khu’wan aspirers and students. On HamariWeb.com, All Naats of Muhammad Imran Sheikh Qadri are available. You can listen, play online or download your favorite Naats read and composed by Muhammad Imran Sheikh Qadri on this page. Find latest collection of Imran Shaikh Qadri Attari Naats 2019 on HamariWeb. Listen and download Naats of Imran Shaikh online from our website. Feel free to give your feedback and suggestions to us by commenting and reviewing on our page.